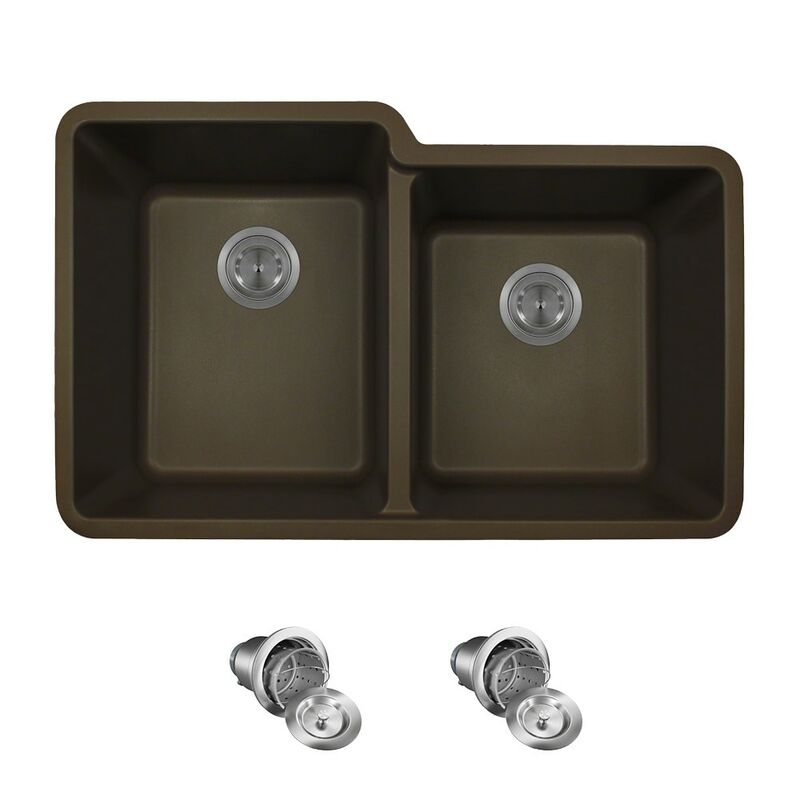 The MR Direct 801-Mocha sink, a rich chocolaty-colored model, has numerous exciting features; not the least of which is its TruGranite composition. A balance of 80% quartzite and 20% acrylic, makes for a very dense, nearly impervious substance with a very attractive, satiny-smooth appearance. It is nearly impossible to scratch or stain because of its density, and it can withstand extreme temperatures - a dropped knife will not scratch, acidic foods will not stain, and hot pots will not burn the surface. No sound-dampening pads are required because TruGranite is inherently quiet. The 801-Mocha model is designed for mounting under the countertop. It has two equally wide sinks, but one is shorter than the other. This offset appearance adds to its charm and function, as it allows for the faucet to tuck in closer at the back of the sink. With an overall measurement of 32 1/2" x 20 3/8" x 9 1/2", it will require a minimum-width cabinet of 33". It is cUPC certified. The included basket strainers offer deep, perforated, metal baskets, complete with handles. They rest inside the main body and hold considerably more waste than standard models.